கட்டிடகலைஞர் திரு. ரமேஷ் தமிழ்மணி. சென்னையை தலைமையிடமாய் கொண்ட BLD டிசைன் ஸ்டுடியோ நிறுவனத்தை 2007ல் தொடங்கினார். இந்நிறுவனம் மூலம் சென்னை மற்றும் அதன் சுற்று புறங்களில் உள்ள200க்கும் மேற்பட்ட வணிக மற்றும் குடியிருப்பு வளாகங்களை வடிவமைத்துள்ளனர். ‘அதர்வா’ நாவலின் ஓவியரின் நட்பு இந்நாவலுக்கு வித்தாய் அமைந்தது. Mr. Ramesh Thamilmani is an architect, founder of Chennai based BLD Design Studio. The hugely successful venture, founded in 2007, has been responsible for the execution of over 200 commercial and residential projects in and around Chennai city. On meeting with the illustrator of Atharva, Mr. Thamilmani decided to extend his creative vision and author a novel. Bollywood Superstar Shah Rukh Khan will soon be seen in a as a mythical hero in an upcoming graphic novel ‘Atharva – The Origin’, starring as the novel’s titular character. The project is a debut undertaking by Chennai based Virzu Studios. The project isHeaded by Vel Mohan and produced by Mr Vincent Adaikalaraj.The novel is authored by Mr Ramesh Thamilmani with illustrations by Mr Ramesh Archarya. A teaser for the project was released on Youtube in the first week of the new year to a very favorable public response. So if you thought Shah Rukh Khan was only entitled to for 2 official releases- Fanand Raees in the coming year then well, here’s the twist! 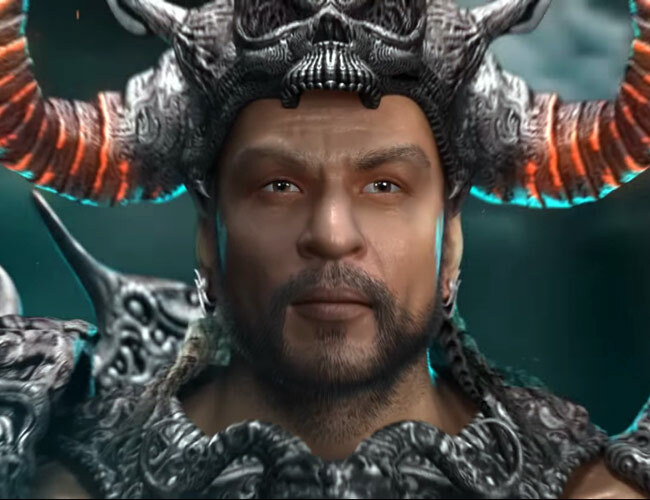 SRK has extended his mettle to carry an animated avatar for an upcoming, new-age graphic novel titled Atharva-The Origin. Yes! Shah Rukh khan will soon be seen in an very unique never before seen looks in an upcoming graphic novel “Atharva – The Origin” . The film happens to be a animation film where SRK will be seen as a prospective king in a very rough and tough rugged looks.The film is based on a prospective king making a difficult and lone journey.The film is been written by Ramesh Thamilmani. The illustrations is been given by Ramesh Acharya. WATCH: Shahrukh Khan’s next is titled ‘Atharva- The origin’! New Delhi: Shahrukh Khan will be seen in a complete new avtar in 2015. His next film ‘Atharva- The origin’, will showcase him as an ancient warrior. Atharva is a graphic novel and an adaptation of Ramesh Tamilmani’s novel of the same name. Shahrukh Khan, the Baadshah of Bollywood or King Khan will be seen in Atharva – The Origin, a graphic novel. SRK will be playing a mythical hero, a king who sets out to uncover his destiny. The project sounds very interesting as the makers will be blending writing with rich visual representations. The print version of the novel will be available in various formats. Shah Rukh Khan may still be shooting for his next, Fan, but fans of the King Khan need not wait for too long. The badshah of Bollywood is all set to mesmerise one and all with a new graphic novel, Atharva – The Origin. Bollywood star Shah Rukh Khan has always promoted use of special effects in movies. With his 2011 sci-fi superhero film ‘Ra One’, he took the use of visual effects to a whole new level in Indian film industry.Shah Rukh Khan, who never miss an opportunity to be innovative and support technology, has featured in a graphic novel in a never-seen before animated avatar. MUMBAI: Bollywood’s reigning badshaah, Shah Rukh Khan will be following Rajinikanth’s footsteps with his title role in a graphic novel entitled, Atharva – The Origin. Khan, who is seen in a rather mystical avatar and will now achieve another milestone with the innovative concept of Atharva – The Origin. Redefining visual effects with films like Ra.One, Khan is one of the few actors who experiments a lot with technology and VFX. The first trailer of the film was launched by Virzu Studios this Friday, January 2. SRK is playing the title role in a graphic novel, which is an adaptation of Ramesh Tamilmani’s novel of the same name. The novel is set in mythological era and tells the story of a prospective king who makes a lone, difficult journey. In a mythical land of beasts and dragons, Shah Rukh Khan plays a valiant warrior out to uncover his destiny. Watch the trailer of the coming graphic novel ‘Atharva – The Origin’. ‘Atharva – The Origin’ is a new age graphic novel project by Virzu Studios featuring Shah Rukh Khan as the titular character. Written by Ramesh Thamilmani, the novel is set in very ancient times, when strange beasts roamed the earth. Shah Rukh Khan plays a prospective king who makes a difficult and lone journey to unravel his destiny. ‘Atharva’ chronicles that journey, taking its hero and you on an awe inspiring journey encountering magnificent lands and strange beasts. Shah Rukh Khan might not have a release this year but the actor will be seen in a new avatar in graphic novel Atharva – The Origin. The actor will play the main role in the story which revolves around an ancient warrior.